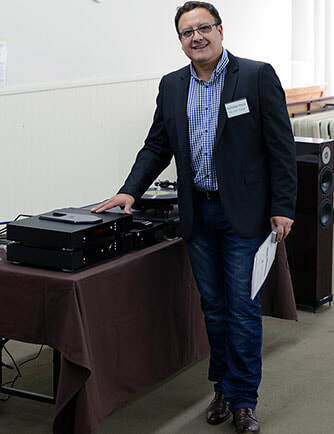 We had an impressive and very musical system for our April 2014 club meeting presented by Nicholas Meza of The HiFi Trader (a retailer based in Newtown). Nicholas, the store manager, takes huge pride in finding great HiFi at affordable prices. The HiFi Trader specializes in: Rega, NAD, Rotel, Arcam, Naim, Cambridge, Spendor, Legend, Monitor Audio, Pro-ject and Thorens. They also have cables from Chord and Atlas, power cords from Isotek, cartridges from Ortofon, and lifestyle products from Sonus and Geneva. (Refer to http://www.hifitrader.com.au/). Rega Saturn-R Compact Disc Player: Refer to http://www.rega.co.uk/. The Saturn-R houses a high specification transport and independent DAC circuit. Both sections are fully remote controllable via the supplied Solaris remote handset. It offers plenty of connectivity options, all at the highest possible resolution up to and including asynchronous 192 KHz - 24Bit. Rega RP8 Turntable: Refer to http://www.rega.co.uk/. 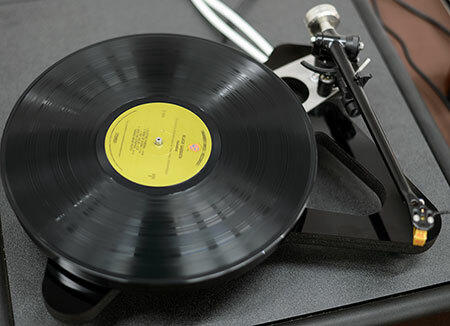 The RP8 has a radical new plinth using custom designed materials, a new tonearm bearing assembly, 24v low voltage motor controlled by a hand tuned electronic power supply and a custom version of Rega’s Planar 9 engineered hub bearing assembly. It has the RB808 tonearm as standard. The cartridge was the Van den Hul MC-10. It’s a custom hand-built moving coil cartridge with VDH-type 1 tip, boron cantilever, matched crystal silver-wire coils and also matched to within 0.65 mV in each channel. Rega Elicit-R Integrated Amplifier: Refer to http://www.rega.co.uk/. The Elicit-R features coupled with polypropylene capacitors throughout the signal path, improved power supplies, increased output power to 100 watts per channel all housed in a brand new custom designed case. Spendor D7 Speakers: Refer to http://www.spendoraudio.com/HTML/S_series.html. It houses the LPZ tweeter built around a stainless steel front plate that forms an acoustic chamber directly in front of the lightweight diaphragm. The phase correcting micro foil equalises sound wave path lengths whilst generating a symmetrical pressure environment so the tweeter operates in a balanced linear mode. The D7 mid-bass drive unit has an advanced EP77 polymer cone. The low frequency drive unit uses a bonded Kevlar composite. Tying everything together was Rega interconnects, Chordspeaker cables and Isotek power cables. From talking with various people, I did get the impression that people were generally in agreement about the overall sound qualities. The Spendor D7 speakers were universally hailed as being very good, albeit a wee bit bright at times. They looked and sounded very refined, clean and modern. The mid-bass was punchy which gave the impression that they went deeper than what they could actually achieve. They usually sounded balanced but being small floor-standers, they would fare much better in a room commensurate with their size. The preferences weren’t so clear cut regarding the Rega Saturn-R CD player vs the Rega RP8 turntable. The Rega turntable was well received and would have to be considered excellent value at its price point. However, like some I thought it may have been somewhat light-weight in sound and that it lacked deep bass. And to my ears it sounded like it lacked energy or was perhaps slightly veiled compared to the CD player. I wouldn’t be so brazen as to declare the CD player to be superior – I think we’d really have to hear the system in a more appropriately sized room to decide which we preferred. The integrated amplifier was a lovely unit that didn’t seem to put a foot wrong. It sounded sweet, detailed and well balanced with good bass. Of course, it could have caused some of the brightness – it’s often difficult to determine the real source of flaws in a system of unfamiliar components. Our member’s music segment was hosted by Andrew Vagi this month. The male Croatian A cappella choir was excellent and possibly the best track of the day! And it was a stand-out recording to boot. Hardy clapping afterwards attested to Andrew’s 5/6 selections. And there were many favourable comments to me and on the feedback forms afterwards. Thanks Andrew! After our break, we had our usual BYO session. There was lots of great music with wonderful diversity once again. As is usual at our meetings, when it comes to the music you can’t please everyone. Some loved Zappa and the electronica of TrentMoller and Nicolas Jaar; whilst others clearly liked the classical like Bach and Paco Pena; and yet others liked pop like Barbara Streisand and James Taylor; and then there were the more easy listening preferences like Neil Young’s ‘Old Man’ and jazz sensation Gabriel Anders. We try to balance the music to give all genres a fair go, but we are of course limited to the music that we are given to play. Thankfully, we have tolerant members that are prepared to listen and accept it all even though it may not always be to their liking. Openness, respect and tolerance are but a few of the admirable traits we appreciate in our members – thank you! I’d like to give extra thanks to Steve for the wonderful tiramisu. Many wrote on their feedback form that they wished to pass on their appreciation to Steve. And many commented in person. Thanks Steven. And I’d like to pass on our thanks to Nicholas for the opportunity to hear Rega and Spendor at our club. It was all great gear and at affordable prices indeed! Speakers were a bit too clean/bright. Sounded better with vinyl.